I would send them to my mum! She is so supportive and always makes sure we are all okay! She is very caring. I’d send it to my Mum as she couldn’t then tell me off for spending too much on her! For my wife to keep me / get me in her good books! I would send it to my second mum, my mother-in-law, she always there for me and that would be a lovely present for her as she deserves it. my very hard working daughter deserves this lovely prize! I’d send it to my Mother-In-Law-to-be because she’s been really helpful to us even though she lives over 4 hours drive away! I’d keep them myself but share them! We’re all recovering from a very nasty coughy virus so a treat would be nice. I would love to give this wonderful prize of flowers, chocolates and wine to my Mum who truly deserved them but sadly she is no longer with us. So I would have to keep them for myself and think of her and how wonderful a mother she was. I would give it to my mum. As a single mum with health problems, I don’t know what I would do without her – she helps me with my kids so much! I’d be tempted to keep it myself. I no longer have my mum and so I’ll look at them in her memory! My mum doesnt like choc so I would keep this for me – I would give her flowers! For mummsy of course! But I am sure she will share the wine and choccies!! My Mother-in -law. She’s amazing. would give them to my mum! she deserves a treat! I would share with my loved ones. I’ve no kids so never get anything for mothers day so that would be a lovely treat for me. I would send it to my mum as she has recently moved to the other side of the country and I really miss her! I have kids and I’m keeping the flowers for myself. I would like them in memory of my late mum. I’d give the flowers to my mum for all she does for us, the wine to my sister – she needs it with her 3 kids and me and the little one would share the chocolates!! I would send these to my grandmother who has 6 great gandchildren, 6 grand children and two children. She loves flowers and woul dbe delighted to recieve these. I would have to keep them for myself as my Darling Mam is no longer with us. Very tempted to keep it all for myself, but would send to my daughter. I would take some of them to the cemetary for my mum and save a couple for myself so we could share them. Sadly my mum has passed away so I’d raise a toast to her and I know she’d be looking down and smiling. I would love to give it to my sister as she’s a great mum and her kids are to young to buy her a special gift. I’d send to my mum. I would keep them for myself but put the vase next to a pic of my lovely Mum now in spirit. My mum has unfortunately gone now but I am a mum if that counts! My mother passed away around Mother’s day three years ago and I would keep them for myself since I am a mom. I’d give it to my Mum – and hope that she’s share with me !! I’d keep it for myself but think of my departed Mum. I’d give it to my mum. She isn’t treated enough! I would keep it to myself, at least I will be guaranteed at least one present. Sadly my mother died in November so I would keep them myself and be reminded of her. mmmm i’m a chocoholic so I would be tempted to sneak one, but I would give them to my mum I’m sure she’d share them with me anyway! To my darling mother of course, she would love them! I would give them to my mum but I would be tempted to keep them myself they’re beautiful and I wouldn’t get to see them as she live too far away! My mum loves flowers so I would have to pass them onto her. I would give them the the lady on the PTA who does so much for the school my son is at. If I’m completely honest, I would probably keep the chocolates and give my mum the flowers and wine. I would definitely give them to my wonderful Mum. My Mum lives in Mallorca so I’d have to keep them and enjoy them for her! I would give to my mum but I would be tempted to kepp for myself! As my lovely mum died last year I would look after them for her. My lovely mum of course. I’d be tempted to keep them, but I know how much my mum would love to get some flowers and wine so I would send them to her. I would send them to my mum! I’d give it to my Mother. Id keep it for myself i never get flowers i only get chocolates which others seem to eat most of them. Although it could be tempting I wouldn’t keep these. I know my Mum would enjoy them a lot more that I would. My Mum, she loves flowers. It would most definitely be given to my mum! id send them to my grandma for mothers day she is 93 in may and i simply love her she is independent and fun life wouldn’t be the same with out her! Great pressie for my Mum. I never ever get flowers so would be nice to keep! I’d send it to my wonderful Mum as I won’t be able to see her on Mother’s Day. I’d give it to mum. She would love the surprise. I would like to give the chocolates to my mum, she loves chocolate and likes to share treats with family and friends. The wine, as my mum doesn’t drink alcohol:- I would use as a treat to share with friends. The flowers I would offer my mum (she would be delighted to see them, though she would decline the offer. As she doesn’t like to think off/or see the flowers dying.) So we would discuss and decide who to give these to, as a treat and possibly a thank-you for a kindness done or a happy occasion shared. I would send them to my mum, she loves flowers. I would give it to my mum… would probably keep the wine for myself though! I would definately give them to my mum! My Mum would be the recepient of such a lovely prize- she would be overjoyed! I would send them to my friend Freda. Tempting to be selfish and keep, but my ma-in-law would be very chuffed to receive this! I’d be tempted – but I’d give it to my mum! I live with my mum so we can share!! I’d like to say I would give them to my mum but I have to admit I’d be very tempted to keep them myself. My hubby always forgets Mother’s Day and I never get flowers! I would send them to my mum as she lives far far away! I would keep them for myself as my Mum is deceased and I don’t get anything from my Son for Mother’s Day. Flowers are definitely meant to be given … I’d give them to my sister, as her baby is too young to buy flowers, yet … I’m not saying that there is anything wrong with a bunch of dandelions, plucked from the cracks in the patio by your toddler … In fact, they can mean more than a shed load of roses … But, I think my sister deserves these lovely blooms, too! I would give this to Mum as it’s her 80th birthday as well as mother’s day! I would defo give them to my mum! As tempted as I would be to keep it for myself, I would give it to my mum. She deserves it! Would be tempted to keep them but they’d have to go to my mum. My lovely neighbour like a mum too me. I would keep them for myself… I dont talk to my mum. I would send it to my lovely mum. For my mum – shes so great! Would give them to mum for a big thank you for everything she does for me, but woud be secretly wishing I was keeping them! I’d give it to my daughter as a gift from her three month old son. would keep it myself, could not give to my mum and not my mum-in-law. I would be sorely tempted to keep the prize myself but I would hopefully send it to my mum. My mother could have the flowers my father the chocolates and my husband the wine. Everyones happy. I would send to my friend as she is due to have an operation shortly, and these would cheer her up. I’d send it to my sister because she’s just got 2 job interviews -to wish her the best of luck! I would love to win these lovely gifts for my daughter who is almost a mummy shes been through so much throughout this last 7 months shes suffered HG from 6 weeks shes had Iron issues so needed Transfusions shes had a bleed within the sac,her partner left and now baby is late this would cheer her up n end !! I’d send it to my mum. As much as I’d love to keep it to myself, I’d have to send it to my mum because she deserves it. I would probably keep these for myself as I rarely receive flowers. They would look lovely in my front window for mothers day. The choccies would go to my mum and the wine to my sister. It would have to be my lovely mom! I would keep it for myself as my Mum lives abroad and I couldn’t get it to her, but I would share it with my teenage daughter to make our bond stronger. I’d give them to my mum and hope she shares! I’d give them to my wife! I would send this to my mum as she deserves a treat. Definitely give it to my mum! I’d send to my wonderful mum! I’d give them to my mum. My Mum, she is a chocoholic! I would give it to my daughter, a young mum who works full time and shuffles the demands of her son and deserves a treat. 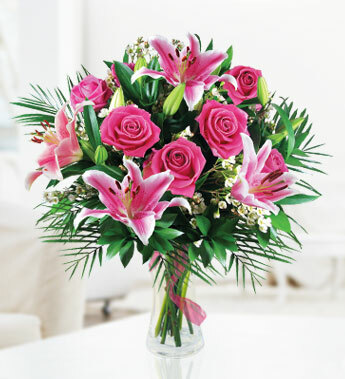 As pink lilies are my favourite I’m sorry but I would have to keep them myself !!!!! I’d send it to my Mum of course! She works long hours as a nurse and could do with a treat! I would love to send it to my mum! id love to keep them for myself as my two teenagers never think id just like a bunch of flowers. My mum has passed away so I would keep the flowers and put them on the window sill in memory of her. I would be tempted to keep them but would probably give them to my mum! Mum would have flowers, i have the chocs, and share the wine! !..share as best friends do!! I would give this to my mother in law as she has been a great support to us over the years. As my mum passed away 14 years ago, I might be kind and let my husband give it to my mother-in-law. On the other hand …. I would send them to my mum because I love her so much and recently moved away from home and miss her. Id consider keeping the flowers. The wine and chocolates would go to my mum in law. I would Love to keep them for myself. I’m not greedy but i absolutely LOVE flowers!! I’d send it to mum as I know she’d share! I would give these to my mum, because she deserves a treat for being so strong and dealing with a lot of stress in her life in respect to her children. Might have to give it to my Mom, booooo, but she is the best! I’d send them to my mum to say thank you for everything she has done for me over the years. Flowers & chocs for mum-in-law and keep the wine for myself! I would love to treat my mum with it as she is a very strong independant woman who raised me and my four siblings on her own, she taught me so many qualities and she is the main person I turn to whenever I need some guidance, support or love even though I am a mum myself now. She has battled depression for around 5 years now and at times is a shadow of her former self, but when I need her I see the strong female role that I grew up with. I love her so very much and likewise I know she loves me unconditionally. Well – I would love to give something special to Mum because she is the best and I and my brother and older sister, cats, dog, rabbits and goldfish lover her to bits! You are the greatest Mum in the world! Would send to my mum, she loves flowers! I’d have to give it to my wee mammy, she would probably give me a choccie or 2 though! Well, since my mum is on holiday, I can keep it to myself – guilt-free. I’d give them to my mum, although i’d be very tempted to keep them myself! Its beautiful, they would go to mum, though I suspect I would get the lilies , as I love them but for mum they are funeral flowers ! Though as they are such a gorgeous colour and not white I am not sure. Unfortunately my mum is no longer with me, I would give them to a friend of mine who has recently lost her daughter. For myself as my hubby had decided to hop off on a stag weekend, leaving me at home alone with the kids, very mothers dayesque!! I would love to keep it for myself! it would cheer me up. I would share with my mother-in-law, flowers and chocs for her, wine for me! I’d give it to my mum she deserves it much more than I do!! I’d give it to my Mum! For one, I’d be selfish – I’m afraid to admit I’d keep them all myself!! I would send them to my mum. I would have to give the flowers to my Mother as she fell yesterday and broke her wrist and I’m feeling guilty as I haven’t got up to see her yet. I would send the flowers to my mum, but wouldn’t feel guilty for keeping the wine as she doesn’t drink. I would keep it myself as I;m sure my husband will forget to get me anything from my little girl! My Mum – she can’t do enough for me – just a little thank you.